Mouse Radio! They play Disney music 24 hours a day, even full ride audio! Hotel Kingdom.com Great Hotel Rates! Carrie Ann's (That's Me) Page! AERIAL VIEW OF HOTELS NEAR DISNEY THEME PARKS Great Map! 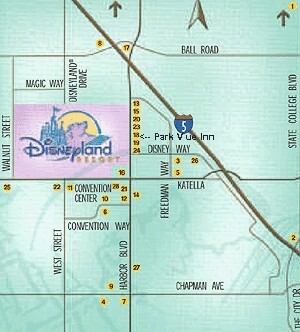 Park Vue Inn is between 18 and 19, just after 18, it isn't a Disney Good Neighbor Motel... But it is right at the crosswalk to Disneyland and cheap. Also has plenty of parking. E mail me if you have any questions or suggestions!